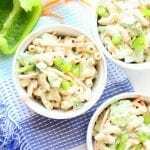 Low FODMAP Macaroni Salad puts a healthy twist on my Dad’s classic macaroni salad from my childhood. I used a lentil-based pasta, added some veggies and kept all the zip and flavor of this traditional picnic dish. My parents are coming into town today to attend a pet adoption event at Brian’s office, and to celebrate my upcoming birthday (I’ll be 29 next Friday!). The dinner plan is to cook on the grill, enjoy homemade caesar salad and fresh seasonal veggies. I’ve been dreaming about this meal as well as our company coming to visit all week and it’s had me thinking about warmer weather and eating outside. Eating outside is one of my absolute favorite things to do – so I’m hoping this year we can do it often! As a kid, we would often grill outside, attend summer picnics with friends, and camp. There were a few foods that would always make an appearance, and one of those foods was my dad’s Macaroni Salad. The dressing is creamy, subtly sweet and has a bit of zip thanks to mustard and vinegar. 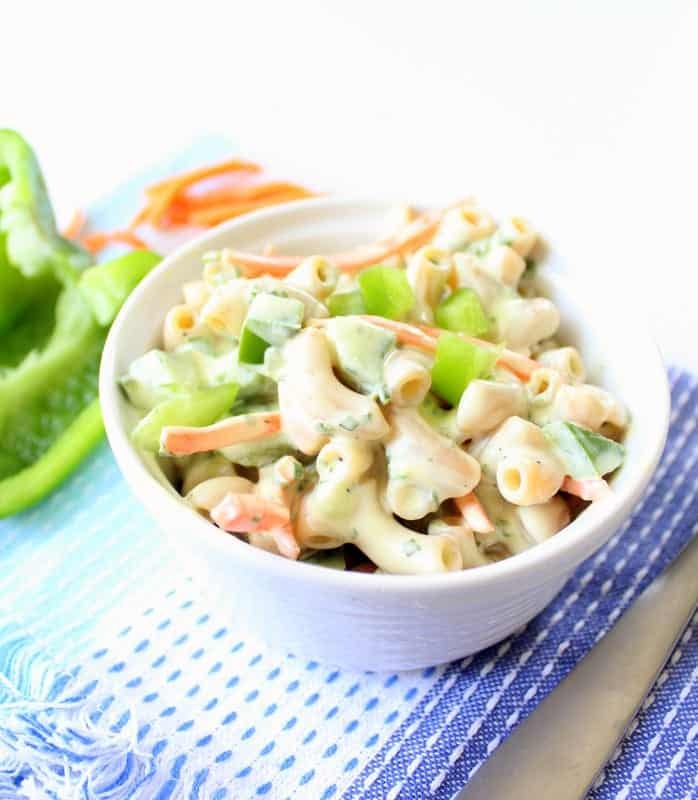 The texture is crunchy with fresh green peppers and soft with the tender macaroni. Something about this dish just screams SUMMER – making it perfect for picnics, grilling, and any other type of outdoor eating. Today is also special because it is Recipe Redux day! 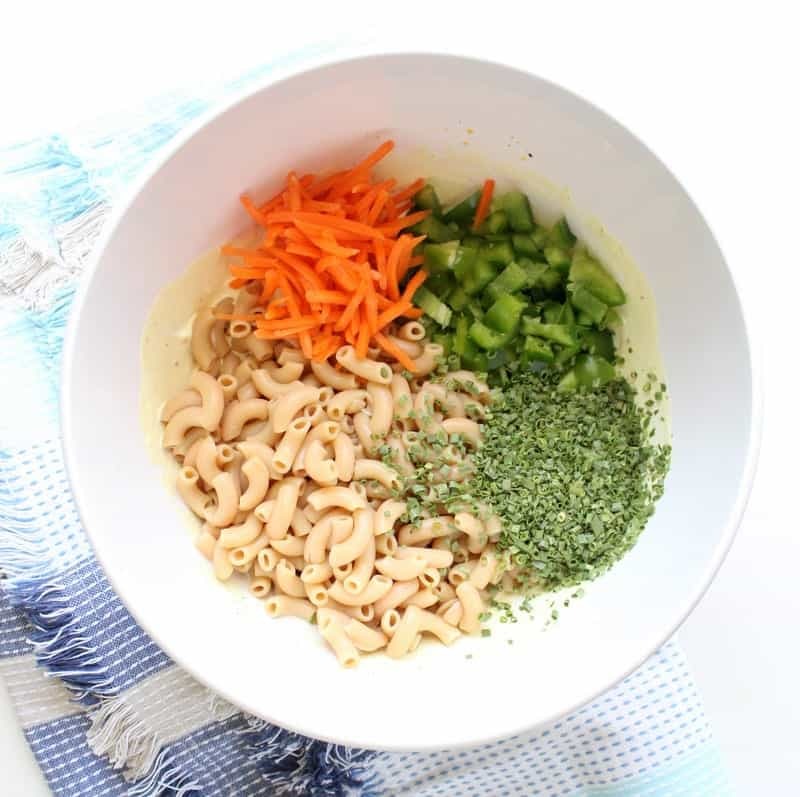 I haven’t shared a Recipe Redux post in quite some time, so for anyone new, The Recipe Redux is a monthly recipe challenge hosted by Registered Dietitians. Participants can be any kind of healthy living enthusiast, and each month we receive a theme that we must craft a nutritious recipe around. 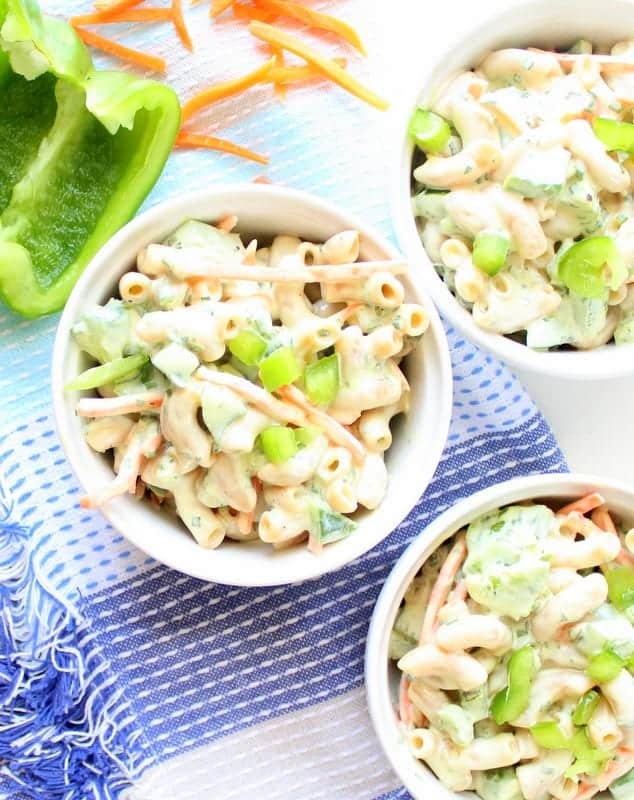 This low FODMAP macaroni salad dish is perfect for outdoor eating because you can package it in individual containers or one large container and then divide it up at your outdoor destination. It can be a complete meal (simply increase the portion) or you can pair it with your favorite protein such as chickpeas, salmon, chicken, etc. It would taste delish with all of these options! 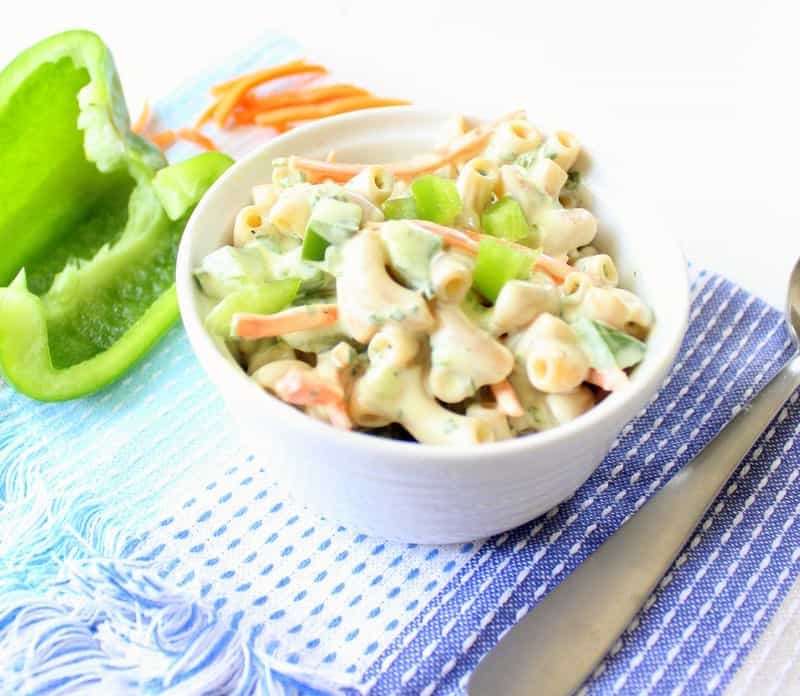 Pick items for your menu that you can prepare in advance (like this Macaroni Salad) and pair it with items that require almost no prep at all like chopped fresh vegetables and fruit, hummus, cheese, nuts, etc. Don’t forget silverware and napkins – there is always some kind of mess to clean up. Load the cooler with ice to keep items at a safe temperature. Find a spot that is part shade and part sun. Bring a large blanket/blankets to sit on. I used a lactose free plain yogurt to make this low FODMAP, but you can use a regular Greek yogurt or a dairy-free yogurt if you wish. I used an avocado oil based mayonnaise with simple ingredients, but you can use a vegan mayonnaise instead. To make this vegan, simply use the two swaps listed above (dairy-free yogurt, and vegan mayonnaise). If you want to use traditional pasta, you can – I didn’t test it this way but I can’t imagine it would change the flavor too much. In a large bowl, combine the yogurt, mayonnaise, vinegar, mustard, salt and pepper. Add the macaroni, green pepper, carrot and chives to the dressing and mix to combine. Nutrition is calculated with non-fat Greek-style yogurt. To make this a meal you can add your favorite protein, or serve in a larger portion. What is one of your favorite picnic or foods that you love to eat outdoors? Perfect low FODMAP alternative, but still loaded with flavor. Thank you! 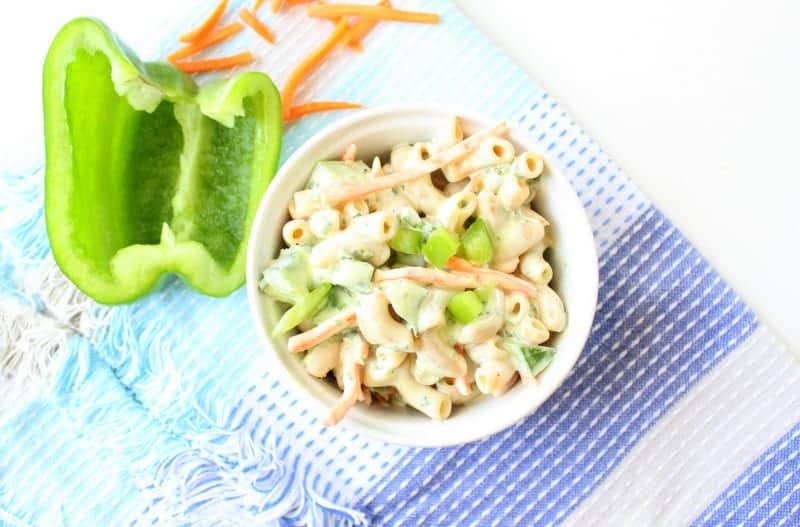 I love how you have replaced most of the mayo with greek yogurt in your macaroni salad dressing! Sounds delicious… especially all the chives! 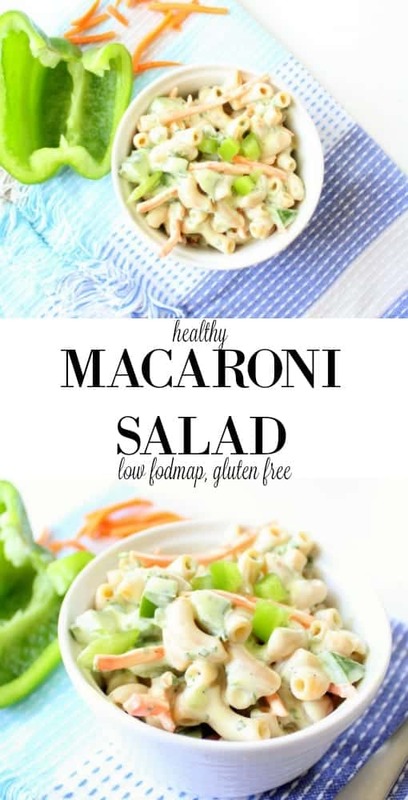 I love macaroni salad and this one looks delicious! Happy birthday!! This looks delicious! I haven’t been brave enough to try a picnic so far in this Indiana spring, but this next week looks lovely so I might have to go for it.